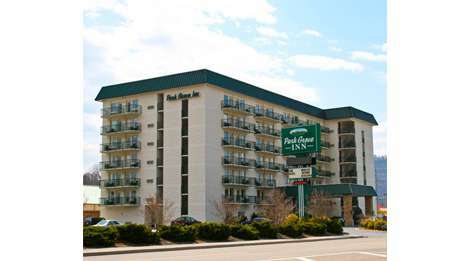 Situated in the heart of Pigeon Forge, and at the foothills of the scenic Smoky Mountains, you will find what you are looking for in a hotel at the Park Grove Inn! Our inn is a seven story structure with breathtaking balcony views of the mountains and downtown Pigeon Forge. All of our beautiful, spacious rooms have wireless internet access, microwaves, refrigerators, hairdryers, irons, and ironing boards. When you are not taking in one of the many area shows, shopping at one of our many outlet stores nearby, or visiting Dollywood, you can find relaxation in the amenities our hotel has to offer. Your children will have fun in a well equipped arcade room, and you may choose to relax in our indoor pool and hot tub, or recline beside our outdoor pool and mushroom waterfall! You will be treated to a wonderful continental breakfast the next morning with a variety of choices. We also have a fitness room with BRAND NEW equipment, a computer with printer, laundry facilities, and a conference room.